Directional signage and additional Guest Service Representatives throughout the Terminal will ensure passengers receive accurate guidance to the South pickup area. Directional signage and additional Guest Service Representatives throughout the Terminal will ensure passengers receive accurate guidance to the new pickup area. Temporary relocation of South Terminal commercial vehicle drop-offs to the North Terminal. All commercial vehicle drop-offs – including hotel, off-airport parking and regional commuter shuttles – will be moved from the South to the North roadway. ParkATL, ATL’s on-airport parking shuttle, will pick up passengers outside of Door N3. 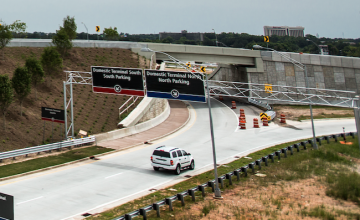 All lanes on the Airport’s North roadway will reopen on October 6, with only nightly partial roadway closures causing minimal impacts as North canopy finishes are completed. Work is complete at the main security checkpoint to make way for new extended queuing lanes and Automated Screening Lanes. These improvements will boost efficiency in passenger screenings, ultimately decreasing security wait times before flights. This deck, adjacent to the SkyTrain Gateway station next to the Georgia International Convention Center, is connected to the Airport via a 2-minute ride on the SkyTrain. This is a fast-track project, with construction commencing once design elements are complete. The site has been cleared and excavation started. Structural work will begin in early 2018, with completion expected by the end of 2019. The new parking deck is expected to have 5,700 spaces on seven levels, incorporating an elevated pedestrian walkway to the SkyTrain where passengers can connect to the Domestic Terminal. 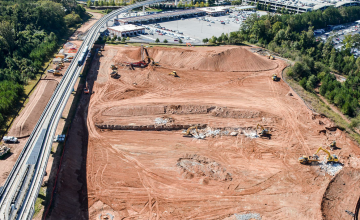 As part of ATL's ongoing mission to become one of the world’s greenest airports, this project is seeking Parksmart Certification, the LEED equivalent for parking decks. Eight phases of pavement replacement have occurred across five taxiways. A total of 34,000 square yards of pavement has been replaced, along with more than 300 LED light fixtures. The remaining phase of these upgrades impacts the Delta TOC (Maintenance) Ramp. We are coordinating with the FAA to obtain permission to allow aircraft leaving the ramp to have the flexibility to exit left or right. This modification to standards would significantly benefit air traffic control movement and safety of aircraft operations across the airfield. The passenger boarding bridges at select gates on the Domestic concourses are past their life expectancy, causing replacement and renewal at these gates. Construction has been completed on a new Domestic commercial vehicle and taxi staging area, including a taxi driver assembly building. A new bridge and roadway provide access to the hold lot. Renovations have been completed at the Airport's Security office to update facilities and improve the queuing area. Phased renovations of concourse hold rooms are underway; new ceilings, windows, and seating lend to a modern, open feel at the gate waiting areas. Gates on the South side of Concourse T have been completed so far. Of ATL's 193 hold rooms, 116 will be modernized. A brand new digital board greets passengers at the top of the escalators as they exit the plane train toward baggage claim. Measuring 27 feet wide by 7.5 feet tall, the large-scale screen welcomes passengers to Atlanta with messages from the City of Atlanta, Georgia leaders, hometown heroes, and Hartsfield-Jackson. Formerly the site of the beloved Spirit of Atlanta mural, the notable image of the young girl in Centennial Park has been digitized and is also in rotation on the board. Approximately 95% of passengers exiting ATL use this path to baggage claim and ground transportation. ATLNext is the Airport’s new development program. It consists of a series of projects over the next 20 years designed to boost capacity, renew and replace existing facilities, and enhance ATL’s aesthetic appeal. These projects, which fall under six general areas, will help secure Hartsfield-Jackson’s position as the world’s busiest and most efficient airport, and further bolster the Airport’s goal to provide the best possible customer service while meeting passengers’ changing needs.